3/04/2018 - A recent trial looking at the prevention of root diseases – primarily Pythium and Phytophthora − at a wholesale tree nursery in Oregon compared the performance of the biofungicide ASPERELLO™ T34 Biocontrol® with three other biological products. According to the grower, Jim Ellefson, the results were clear-cut with ASPERELLO™ T34 Biocontrol® outperforming the competition. Containing the antagonistic fungus Trichoderma asperellum strain T34, ASPERELLO™ T34 Biocontrol® has multiple modes of action. On colonized plant roots, it forms a barrier against pathogens and supports healthy root growth. Furthermore, it triggers the plant’s natural defence mechanisms. Finally, it parasitises and actively kills pathogens. The product can be used preventatively to protect ornamentals against major root diseases, including Fusarium, Pythium, Phytophthora and Rhizoctonia. The trial was carried out with Jim Ellefson, of Woodburn Nursery, in Oregon - on the West Coast of the USA. 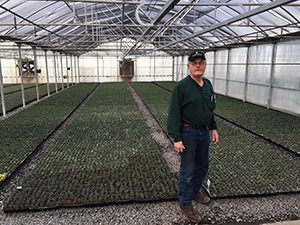 Owned by the Fessler family since the 1960’s, this 500 acre nursery grows florist grade azaleas and potted nursery stock. The nursery consists of 120 acres of covered production, of which 56 acres are devoted to florist grade Azaleas. The nursery stock production includes 65 acres of can yard, and 225 acres of pot-n-pot production. In addition, the large farming operation produces wide variety of crops such as Blueberries, Hazelnuts, Grass seed, and various row crops. The species selected for inclusion in the trial were Blue Star Junipers, notoriously difficult to root, and Siberian Cypress that are particularly prone to Phytophthora and Pythium. Alongside ASPERELLO™ T34 Biocontrol®, the trial featured three other competing biological products. Would you like to know in which crops ASPERELLO™ T34 Biocontrol® is allowed to be used? Be sure to also read ASPERELLO™ T34 Biocontrol® improves root environment of various ornamental crops.